I’d been excited to visit Luang Prabang and the surrounding area since hearing about it from several travelers in Vietnam, and the UNESCO heritage town certainly did not disappoint. The Kuang Si waterfalls about 35km outside of town are the most popular attraction and are easily reached with one of the ubiquitous tuk tuk drivers. While the falls themselves are beautiful, more impressive for me were the smaller, terraced, turquoise waterfalls below which reminded me a bit of Pamukkale in Turkey. There were swimming holes as well and the more adventurous visitors jumped off rocks and trees, doing flips into the chilly water. There was also a fairly challenging hike (at least it was a challenge in the mud with flip flops on!) to the top of the falls and excellent views of the surrounding mountains. I found a great group of people from my hostel to go with and we had an amazing day hiking, swimming, and watching the bears and the Tat Kuang Si Rescue Center which is right next to the waterfalls. A handy sign directing hikers to the top! What good is a waterproof camera if you can’t take a selfie at the bottom of a waterfall? 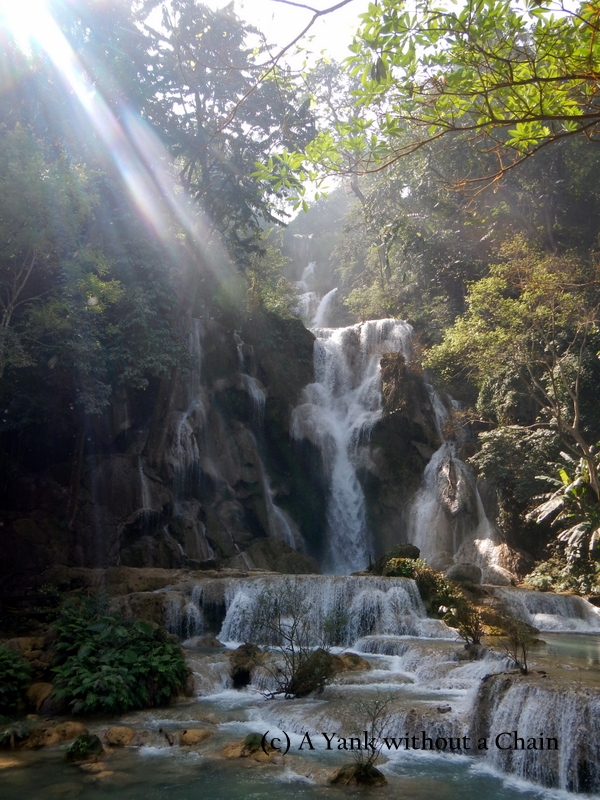 This entry was posted in Laos and tagged bears, kuang si falls, laos, luang prabang, rtw, sightseeing, swimming, travel, unesco, waterfalls. Bookmark the permalink.